North Seattle is the largest area of the city of Seattle in terms of land mass coverage. Stretching from just north of Lake Union to the border of Shoreline at 145th St, North Seattle is mostly residential with pockets of shopping, retail, industrial and entertainment options. With around 40 separate neighborhoods in North Seattle, even local Seattleites can become confused as to the definition of an individual locale's borders. The most well-known neighborhoods in North Seattle can be used as guideposts for the general area, however. Green Lake is one of Seattle's most popular neighborhoods with a lively atmosphere and plenty of recreation and entertainment. Just to the South is Wallingford, a beautiful residential neighborhood which stretches south to Gasworks Park on the lake. Fremont, to the west, is known as a quirky, fun location, and Ballard to its West is a fishing town-turned popular suburban destination. On the East side of I-5 are the University of Washington and some of North Seattle's tonier neighborhoods at the eastern edge in Laurelhurst, Windermere, and Sand Point. Centrally located is Northgate, a major shopping center. Views from a number of these neighborhoods can encompass Puget Sound, the Olympic or Cascade Mountains, and even downtown Seattle skylines from some of North Seattle's highest elevations near Maple Leaf. 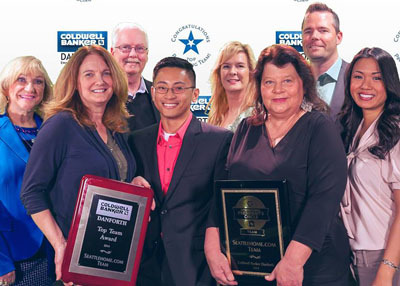 North Seattle is known for having the most highly-ranked public schools in the Seattle School District, and its residents place a high value on having a small community feel while still being a short commute away from downtown Seattle. 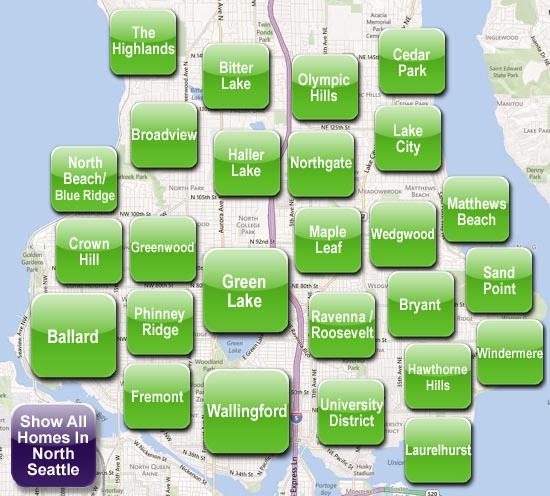 For a full list of all Seattle neighborhoods, use the Detailed Home Search.